Accepted Scientific Name: Frailea pygmaea var. aurea (Backeb.) Backeb. Cactaceae (Backeberg) 3: 1661. 1959 Backeb. Frailea pygmaea var. aurea (Backeb.) Backeb. Frailea pygmaea var. atrofusca Backeb. Frailea pygmaea var. brunneo-mollispina hort. Frailea pygmaea var. dadakii (Frič ex A.Berger) Backeb. 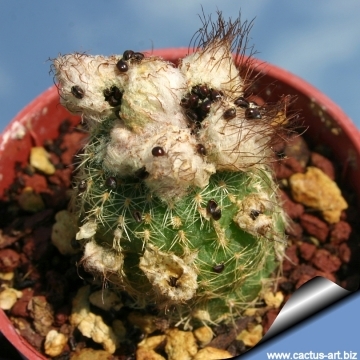 Description: Frailea pygmaea as the name implies ("pygmaeus" meaning dwarf), is a very small cactus that lives half buried in the ground. Most of the plants in habitat are single headed unless they are damaged. 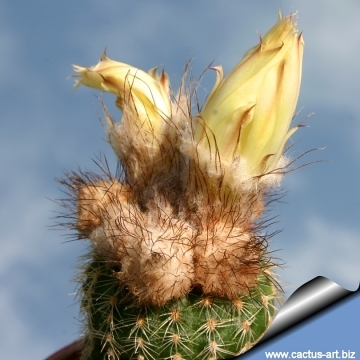 The "aurea" form is very nice, due to it golden-yellow spines and yellowish- or brown-tomentose areoles. The flowers are yellow and opens only during the sunniest summer days. Root: Long tuberose, inversely conical and branched. Stem: 2 to 2.5(-3) cm in diameter and 1.5 cm above the ground (more in cultivation) flattened, dull-green to yellowish-green, depressed at the crown, with a turbinate base. Apex partially covered with sulfur yellow spines. Ribs: 16-18 quite flat, divided by transverse depression into very minute rounded tubercles. Areoles: Yellowish-tomentose (brown in original description ), l.5 mm long and 1 mm wide becoming bare with time, to 5 mm apart. Radial spines: 12-14, c. 4 mm long, golden-yellow, quite fine, partially interlocking, bristly, more or less adpressed, pointing laterally (pectinated) and downward. Central spines: 0-1 similar to radial spines 5 mm long, more erect. Flowers: Yellow, arising from the crown from a very woolly bud, often cleistogamous, 2 to 2.5 cm, up to 3 cm diameter, pale yellow, with dense, whitish to rose-colored pubescence outside. Blooming season: Hottest part of summer. Fruit: 8 mm wide and 1 cm long, round, yellowish, with bright yellowish brown wool and long dark brown bristle forming a pointed head of bristles. Bristles not pungent.The fruit wall is thick, membranous, fragile and it opens by a basal pore to release the seeds that are promptly harvested by ants. Seeds: Helmet shaped, shining, black . Taxonomy notes: Frailea aurea was briefly described by Backebg in 1935, however, from this time onward, most of the F. aurea collected over the years in habitat and currently in cultivations, are not forms of Frailea pygmaea, but forms of Frailea pumila! Further confusion has been added by the fact that F. Ritter in his edition "Kakteen in Sudamerika", vol. 1, Pag. 209, described a Frailea aureispina (FR 1386) and A. Buining collected a Frailea HU 89 with the provisional name Frailea pumila var. aurea. Especially the latter provisional name supported the generally prevailing opinion that Frailea aurea Backbg. (Syn. Frailea pygmaea var. Aurea) is precisely this Frailea HU 89. In the original Danish description, C. Backebg indicated as place of origin of this plant the surroundings of Montevideo in South Uruguay, but more precise indication missing, so that until today the original habitat it is not clearly known. Some plants with sulfur-yellow spines and sulfur-cleistogamous fruits matching the original description where found at “Puenta Ballena” by Prestlé in 1976; could these plants correspond to the true Fraile aurea? Frailea pygmaea (Speg.) 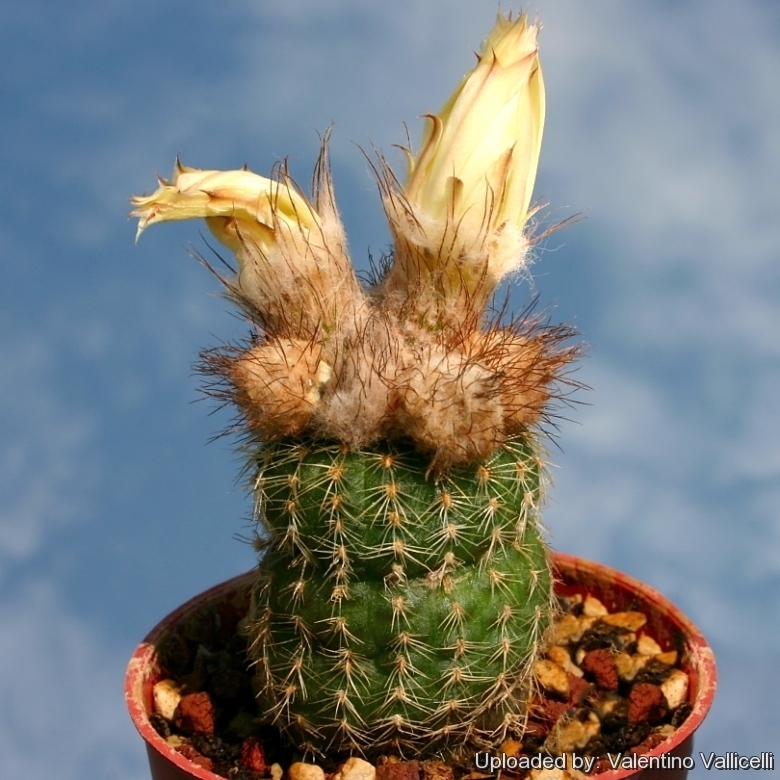 Britton & Rose: is a very small cactus that lives half buried in the ground. It has a wide distribution and is very variable with some forms having heads no wider than one or two cm. Distribution: Argentina, Brazil and Uruguay. Frailea pygmaea subs. asperispina (F.Ritter) P.J.Braun & Esteves: has dark felted areoles and golden-yellow spines stronger than those normally found in F. pygmaea. Distribution: North of Quarai, Rio Grade do Sul. Frailea pygmaea var. curvispina F.Ritter: it has recurved, creamy-brown bristles, short to long, more or less curved backwards, twisted and interlaced. Distribution: Pantano Grande Region, Rio Grande do Sul. Frailea pygmaea var. dadakii (Frič ex A.Berger) Backeb. : has globular stems, depressed on top, with about 12 ribs. It branches profusely forming dense clumps. The spines are all radial, usually 8, brownish passing to white, curved backwards and twisted. Frailea pygmaea var. gloriosa Prestlé: has long glassy-white spines and brown areoles. It is very nice. Frailea pygmaea var. grandiflora: has somewhat larger flowers. Distribution: Uruguay. Notes: Frailea pygmaea has a wide distribution and is very variable with some forms having heads no wider than one or two centimetres. In accordance with the variability of the species, many names have been created for different forms, some of them correctly published but the majority invalidly and nowadays considered as synonyms. 6) Larocca, J., Machado, M. & Duarte, W. 2013. Frailea pygmaea. In: IUCN 2013. IUCN Red List of Threatened Species. Version 2013.2. <www.iucnredlist.org>. Downloaded on 15 February 2014. Sun Exposure: They enjoy full sun but in a shaded position the plants grow faster, but are not flat shaped. Characteristically, during the dry season plants retract completely under the ground both in the wild and in cultivation too. This plant is short living (It does not live long - about 10-15 years). Propagation: With fresh harvested seeds.